In the earliest records of Guernsey County, Catholics were not numbered among the settlers. However, the construction of the National Road and the Baltimore and Ohio Railroad through this section of the state brought many Catholics here. Missionary priests were well aware of these settlers, as Fathers N. D. Young and James Mullon preached the jubilee of Pope Leo XII in Washington (Old Washington) in March or April of 1827. The families of Catholics working on the National Road gathered for prayer in private homes in Fairview, eighteen miles east of Cambridge. A letter from Archbishop John Baptist Purcell, published in the Cincinnati Telegraph in 1834, states that “at Cambridge and near the residence of Mr. McCune on the same road, there are several Catholic families anxious to practice their religion. And a numerous congregation assembles at Washington, eight miles east, where services are held at the home of Mr. Lawn.” In June of 1834, the Archbishop visited Fairview, preaching in the schoolhouse as well as saying Mass at the home of a Mr. Scott. It was in Old Washington in the 1840’s that the first Catholic Church in Guernsey County, Saint Patrick’s, was built. The Catholic families were organized and led by Edward Lawn and James “Long Jimmy” Gallagher. The cornerstone was laid by Bishop Purcell in 1842, although the building was not completed until 1845, at a cost of $17,000. There was no resident priest at that time. The church was attended by Father Brummer and other priests from Saint Mary Church, Temperanceville. By the late 1850’s, the congregation at Saint Patrick’s was shrinking. The railroad had bypassed Washington, and the Irish laborers who build the line had followed it to Gibson Station, settling there as section hands. The last record of any sacrament conferred at Saint Patrick’s is April 7, 1861, when three infants were baptized by Father John Mary Jacquet, then pastor of Temperanceville. In 1866 the church building was purchased for $1,000 by Doctor G. W. Gildea, James Gallagher’s son-in-law, and rebuilt on Leatherwood Creek on land donated by Long Jimmy’s son, James, which was part of his late father’s farm. The church was rededicated in 1868 with Father Jacquet saying the first Mass. Saint Patrick’s was first a mission of Temperanceville, then later of Saint Benedict. The last Mass celebrated there was in 1930. The Gildea family continued to care for the church, but by the mid-1990’s, it had deteriorated to the point that it was necessary to tear it down. In 1873, Father Patrick Heery came to Temperanceville and took charge of the Catholics in Guernsey County. At this time there were only twelve Catholic families living in Cambridge. Father Heery held services at the home of Stephen Quinn, on the corner of 2nd Street and Gomber Avenue, and at the home of Michael Slaymon in Guernsey Mines. There was also a settlement called “Irish Town” near the present location of Mt. Calvary Cemetery, where Mass was celebrated at the home of John Madigan. Father George Montag succeeded Father Heery in 1882. He continued to celebrate Mass at the Slaymon residence until 1894, when Adams Hall, a third floor room on Wheeling Avenue, was leased. Services were held there for the next few years, after which Father Montag held Mass at the William Armbruster residence on Wheeling Avenue. By the year 1897, the number of Catholics in Cambridge had increased to such an extent that Father Nathaniel McCaffrey was appointed the first resident pastor. Soon after, plans were made for the erection of a permanent church. In August of 1897, the Black residence on the corner of 7th Street and Gomber Avenue was purchased from Herman Schultz for $7,000. A bazaar was held, netting $1,600, and through the generosity and hard work of many families, Catholic as well as non-Catholic, a frame church was erected on the rear of the property facing Gomber Avenue. On December 12, 1897, Bishop Watterson of Columbus dedicated Saint Benedict Church. On June 3, 1898, the First Communion Class received the sacrament, and on June 10, 1898, Bishop Watterson administered the Sacrament of Confirmation here for the first time. It is believed that the first funeral to take place in the new church was that of Michael Slaymon, at whose home early Masses had been celebrated. His death occurred in February, 1898. It is of note that two of Mr. Slaymon’s grandsons, two granddaughters, and a great-granddaughter were among the members of Saint Benedict Parish to become priests and sisters. In October of 1900, Father McCaffery was succeeded by Father J. J. Slevin, who remained only eight months before retiring. Rev. Charles H. A. Watterson was appointed pastor in July, 1901. During his pastorate, the parish grew rapidly and flourished spiritually. Numerous baptisms took place, many from Byesville, Buffalo, Senecaville, and other mining towns. In June of 1904, the Rev. John Wagner succeeded Father Watterson. Many changes were to occur during his time here. In 1907 the parish purchased twenty-one acres of land along the National Road, a beautiful location for a Catholic cemetery. When land was first purchased, neighbors along the road went to court, received an injunction, and the original deed did not go through. Soon after this, a young man of the parish, John McDonough, died at the age of eighteen. More land was being purchased for a cemetery, so Father Wagner asked the young man’s father, Patrick McDonough, to keep his son’s body in a vault at the local cemetery until the deed could go through. When the land was officially secured, John McDonough was the first person buried in Mt. Calvary Cemetery. By this time, the parish had grown considerably and the present church was inadequate to serve its needs. Plans were drawn up to build a combination church and school building. The cornerstone was laid in June of 1910. The brick building was described as having a frontage of sixty-four feet on North Seventh Street and extending back one hundred thirty feet along Gomber Avenue. It was to be two stories in height with two schoolrooms on each floor and the church itself in the rear, an auditorium seating four hundred persons. The three altars were described as works of art, with the main altar costing $800. The building was dedicated on November 20, 1910, by Bishop J. J. Harley of Columbus. Father Watterson returned to celebrate the first Mass in the new church and Max Stokely was the altar boy. Saint Benedict School opened in September, 1911, under the charge of the Franciscan Sisters of Christian Charity of Manitowoc, Wisconsin. Sister Aloysius was principal, assisted by Sisters Hyacinth, Justin and Marcella. There were two grades to a classroom and the original church was used as a gymnasium and school hall. In February of 1916, the former Cambridge Hospital, which was located on North Seventh Street on the south side of the first rectory, was purchased for $5,500 and remodeled for use as the new home for the pastor. The former rectory, which had been included in the original land purchase, was then furnished as a residence for the Sisters. It is believed that before this they lived at 233 West Seventh Street, directly across the street from the church. Father Francis Reynolds became pastor in September, 1916. There were approximately 200 families in the parish, with 200 children enrolled in the grade school. During his pastorate, Father Reynolds continued the spiritual growth of the church. It should also be known that when he left in 1925, the parish was entirely free of dept. Father William O’Brien was pastor from 1925 to 1928. He was responsible for many improvements to the church, the most notable being the beautiful stained glass windows. 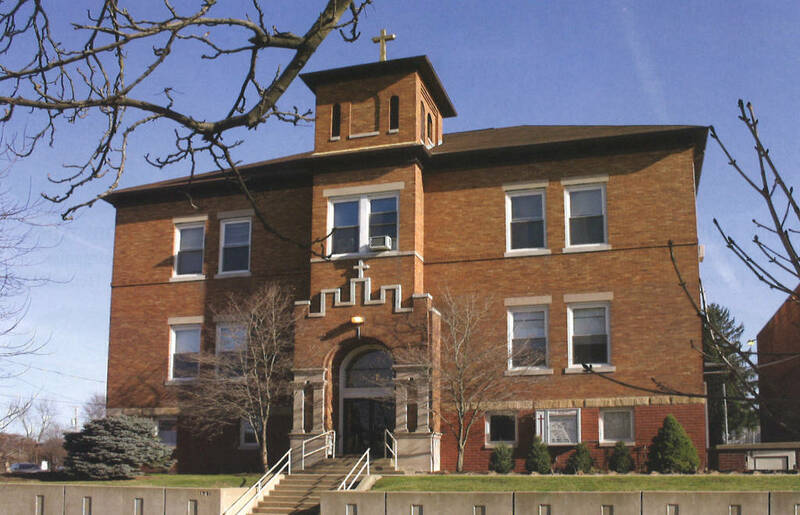 In 1925, Saint Benedict High School opened with a freshman class of eight students and one teacher, Sister Rose Clare, with the first classes being held in the old frame church. In 1928 Father Clement Crock became pastor of Saint Benedict Church. He was both a scholar and a student, being well-known for his authorship of spiritual works. In 1929 a new home on North Seventh Street was purchased for the sisters from William Vasco for $16,000. This same year the first class graduated from the high school. The graduates were Neausrie Buttress, Rosemary Krupp, Elizabeth Nugent, and Mary Rose Schaefer. In the fall of 1929 a high school basketball team was organized. Under the direction of Coaches John McConnel, Bob Young, Stan Kinskey, and Joe Mosser, the team competed successfully in both the county and the diocese, winning the diocesan championship tournament in Columbus in 1941. Later, the former convent was used for high school classes, known to many students through the years as “The Old Brown House” because of its color. Also during this time the interior of the church was decorated by an artist from Vienna, church property was kept in good repair, and the parish in 1942 was dept-free. 1942 Marked 100 years of Catholicism in Guernsey County. It was also the twenty-fifth anniversary of Father Crock’s ordination. On June 2, 1942, a celebration in honor of both events took place. It included a Solemn High Mass, a dinner for visiting clergy and distinguished guests, and a public reception in the evening. In 1945 Father Crock retired and Father George Drescher became pastor. Saint Benedict was now a part of the newly-formed Steubenville Diocese. There were over 250 families in the parish, with 115 children enrolled in the grade school and 37 in the high school. Father Drescher knew that it would soon be necessary to expand the school and struggled with ways to finance these changes. He was well-liked in the community, becoming known for his weekly radio show. On May 21, 1950, he celebrated 25 years in the priesthood and the entire parish rejoiced. So, too, they mourned his unexpected death on March 3, 1951. Both Father Drescher and Father Reynolds are buried at Mt. Calvary Cemetery. Father William Riley became pastor in March, 1951. His radio show on Sunday mornings served to create a better understanding of our faith to all who listened. His death in 1956 at the age of 41 was an occasion of much sadness. Father FrancisTrettel became pastor in 1956. Again, it was a time of many changes. The original frame church was razed and a new rectory built facing Gomber Avenue. The former rectory and the “Brown House” were then torn down to make room for the construction of a new high school building. The school was now called Saint Benedict Central High School as Holy Trinity and Saints Peter and Paul Parishes had joined the school in 1947. The cornerstone was laid in 1958 and the building was dedicated later that year, with the first class graduating in 1959. The grade school now took over the former high school rooms in the church basement, along with the “Block Building”. This was a cement block building originally built as a garage, which had been used for high school classes since 1955. By 1962, however, the schools were again bursting at the seams. The local R.C.A. plant was at its peak and it seemed as though new families were arriving weekly. The high school enrollment had gone from 90 to 125 students, with a projected enrollment for 1965 of 150. The grade school had over 300 students, and was using both the “Block Building” and the social hall as classrooms. The new fund-raising campaign launched in June, 1963, had as its slogan, “Build a high school – gain a grade school.” So the parishioners of the three parishes again pledged their support to build a new school, Guernsey Catholic Central, on route 209 between Cambridge and Byesville. The school was built in 1964, with its first class graduating in 1965. Many changes took place to the church buildings as well during the 70’s and 80’s. One of the double staircases was removed in order to install a “cry room” on the second floor and a men’s restroom on the first floor. There was an addition to the rectory which connected it to the church. New stained glass windows were installed and in 1983 the interior of the church was completely renovated, including painting, carpeting, and a new altar, pulpit, and tabernacle shrine designed and built by parishioner Rod Blazvick. The parish social hall was also remodeled due to the hard work and dedication of the “Bazaar Ladies” of the Catholic Women’s Club. On a more somber note, Guernsey Catholic Central closed its doors in 1983. Enrollment had fallen from 160 students to about 80 in 1963, and the school had placed great financial burdens on the three parishes. The time of Catholic high school education in Guernsey County ended after 58 years. Monsignor Maher celebrated the 40th anniversary of his priesthood on June 14, 1987. He continued to encourage spiritual growth in his parishioners, particularly through the “Christ Renews His Parish” program. Monsignor retired to his native Ireland in 1991. He remained Pastor Emeritus of the parish and returned to celebrate his 50th Jubilee on June 1, 1997, as part of our centennial year observance. He died on July 9, 2001, and was buried in his parish church in Ireland. Father Robert Borer was named pastor in 1991. Father Bob's wise guidance helped to revitalize and refurbish the physical structure of the St. Benedict Church and School campus, as well as to further the spiritual nourishment and formation of parishioners through programs such as New Wine and R.C.I.A. In 2003, Fr. Bob was asked to serve as pastor for both St. Benedict Church and Sts. Peter & Paul Church in Lore City. With the ebb and flow of the Catholic population in Guernsey County, in large part due to some of the larger employers moving to other parts of the country, all three parishes of Guernsey County were consolidated into one parish in 2009, with Fr. Bob named as pastor of the newly-formed Christ Our Light Parish. Fr. Bob continued serving as pastor until his retirement in June 2014. Fr. Paul Hrezo, who had served as parochial vicar of St. Benedict and Sts. Peter & Paul from July 2003 - June 2005 and of Christ Our Light Parish from July 2013 - June 2014, was named pastoral administrator of Christ Our Light Parish in July 2014 and pastor in December 2014. Saint Benedict School continues to be a vital facet of the Christ Our Light Parish and Guernsey County community with a current enrollment of approximately 100 students. Four Franciscan Sisters of Christian Charity serve St. Benedict School along with an exceptional and dedicated team of lay administrators, teachers, and staff. A fifth Franciscan Sister of Christian Charity, Sr. Sharon Paul, serves the parish as a pastoral minister, primarily visiting parishioners who are hospitalized, in nursing homes or homebound. Christ Our Light Parish continues to benefit from its relationship with the FSCC as well as from the generous and creative contributions of its many parishioners.